On this date in 1862, Union Gen. John McNeil had ten Confederate soldiers shot in what history has recorded as the Palmyra Massacre. In the 1850s, the Missouri conflict spilled into neighboring Kansas as the enemy sides of the slavery question fought to determine whether Kansas would enter the Union as slave state or free. The Missouri borderlands of Bleeding Kansas was where the radical abolitionist martyr John Brown made his name, commanding free state militia in a guerrilla war that presaged the coming clash of North and South. The nastiness of the years to come is aptly suggested by this date’s events. Joseph Chrisman Porter, a Confederate officer, was one such possible client of this here site, tapped as he was for recruiting and raiding operations in northeast Missouri. His Union adversary Gen. John McNeil saw Porter as basically a terrorist. In August of 1862, Porter’s aide Frisby McCullough fell into McNeil’s hands: the Union general had McCullough shot. What happened next — though it was not known to the Union at the time — was that Allsman was shot. The pamphlet just cited attempts to obfuscate this event into the fog of war and not really Porter’s fault. The bare fact is that his raiders had gone out of their way to seize an aged non-combatant and then summarily executed him. Not knowing Allsman’s fate, McNeil responded with an ultimatum to his opposite number. Palmyra, Mo., Oct. 8, 1862. Sir: — Andrew Allsman, an aged citizen of Palmyra and a non-combatant, having been carried away from his home by a band of persons unlawfully arraigned against the peace and good order of the State of Missouri, and which band was under your control, this is to notify you that, unless Andrew Allsman is returned unharmed to his family within ten days from date, ten men, who have belonged to your band, and unlawfully sworn by you to carry arms against the government of the United States, and who are now in custody, will be shot as a meet reward for their crimes, amongst which is the illegal restraining of said Allsman of his liberty, and if not returned, of presumptively aiding in his murder. Your prompt attention to this will save much suffering. The Confederates, of course, could not produce Allsman. So, on the evening of Oct. 17, five rebel prisoners in the Palmyra stockade plus five more held in Hannibal were informed that they would be shot the next afternoon, in ruthless enforcement of the threat. Their names adorn the base of a monument erected in Palmyra in 1907 commemorating the so-called “Palmyra Massacre”. The state of Missouri as a digital archive of original documents relating to the affair available here. * Missouri was where the slave Dred Scott lived; his owner taking him to the neighboring free state of Illinois and thence points north occasioned the notorious Supreme Court case that bears his name. 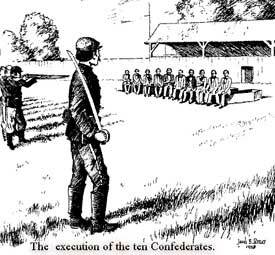 ** Frank and Jesse James were Confederate partisans for William Quantrill in the Missouri war; they segued directly into their more celebrated career in outlawry right after the war ended — robbing banks whilst settling scores with pro-Union men for the rest of the 1860s, before branching out to other points on the frontier. † The Union might obviously have chosen to treat the entire Confederacy as a treasonable enterprise rather than a legitimate enemy belligerent. As a historical matter, it did not take this perspective.